For information on how to configure the Audience module for use with Marketo using the Munchkin ID, see Integrating Video Cloud with Marketo using Munchkin. Before you can make a call to the Marketo REST API, you need to create a new API role with access to all of the APIs, create an API-only user and then create a service that uniquely identifies your client application. The steps to complete these tasks are outlined in the Marketo documentation. Once the configuration steps on the Marketo side have been completed, follow these steps to setup the connection between Video Cloud and Marketo. Select Standard (REST API) and then click Save. Note: For information on using a Munchkin integration, see Integrating Video Cloud with Marketo. Marketo Account ID - To get this value, in Marketo click Admin > Munchkin. Marketo REST API Endpoint URL - To get this value, in Marketo click Admin > Web Services. Marketo REST API Identity URL - To get this value, in Marketo click Admin > Web Services. 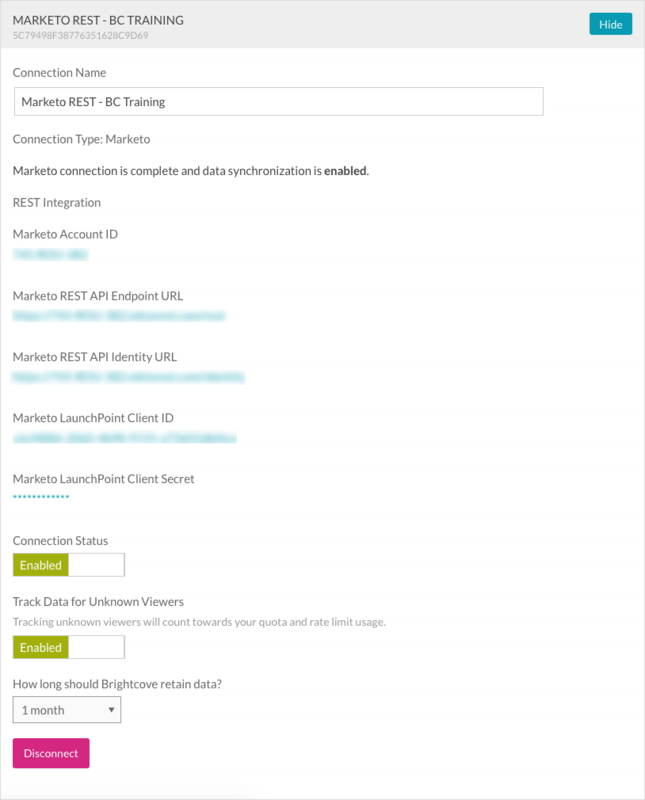 Marketo LaunchPoint Client ID - To get this value, in Marketo click Admin > LaunchPoint and then click the View Details link for the LaunchPoint you created earlier as part of this setup. Marketo LaunchPoint Client Secret - To get this value, in Marketo click Admin > LaunchPoint and then click the View Details link for the LaunchPoint you created earlier as part of this setup. Note: If the correct permissions are not assigned to the Marketo user, an error will be displayed in Studio. Check your permissions and then try again. By default, Track Data for Unknown Viewers will be set to Disabled. Enabling this option will track data for unknown users. Data will be retained based upon the selected data retention policy. If data retention is set to No retention, this field is not displayed. 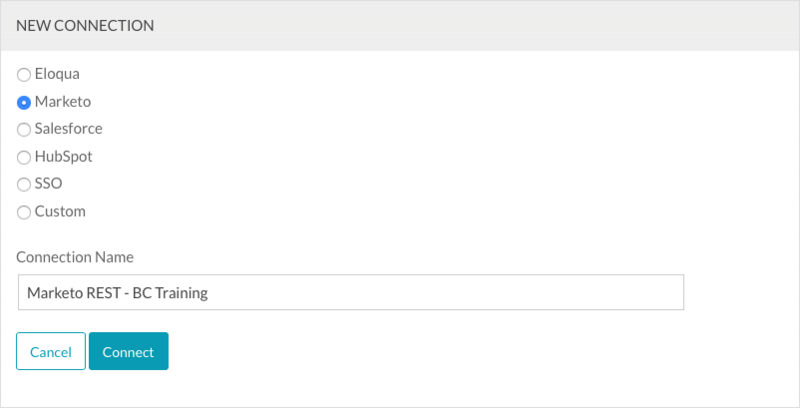 To remove the integration with Marketo, click Disconnect. 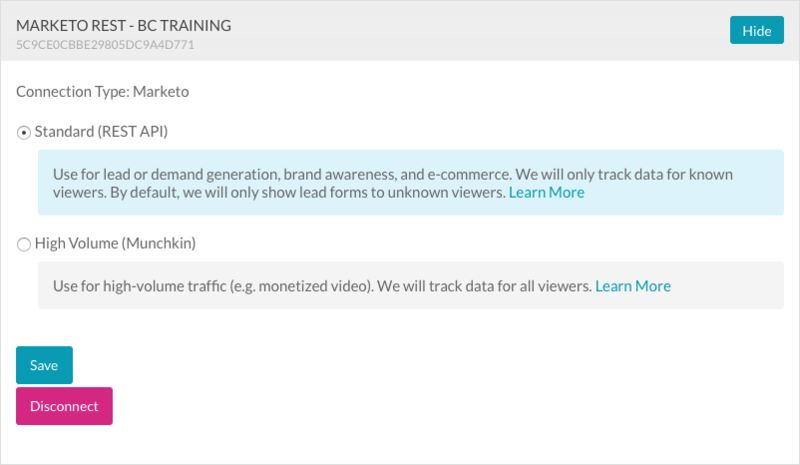 When the integration is configured, test the integration to confirm that video view data is being sent to Marketo. For information on verifying the integration, see Marketo REST Integration Testing Guide.